End Legal Bribery of Our Representatives! The modern system of governance in the United States is infected with a fatal flaw. We are a representative democracy, which works very well for a large, diverse nation like ours. But this system only works if all of our votes count equally, and right now they do not. 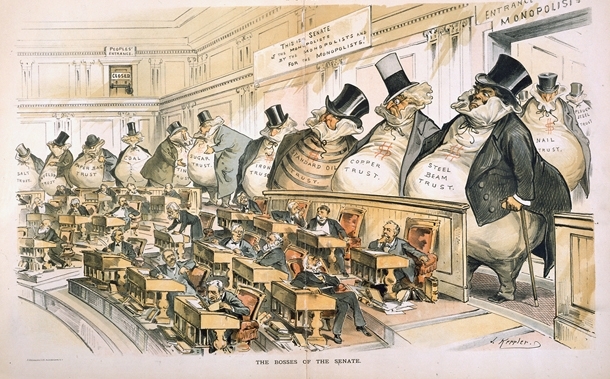 Scroll down to find out how Big Money in our political system robs us of our voting power and why it will take a Constitutional amendment to restore the people's voice. Based on recent figures, successful candidates for the U.S. Senate spent an average of $10.5 million, while successful candidates for the U.S. House spent an average of $1.6 million. And that's just the money raised by the winning candidate - it does not include the millions spent each election year by shadowy outside groups that do not disclose their donors. Over 2/3 of the campaign contributions received by candidates for Congress come from Big Money donors or secretive groups. It realistically costs money to run a campaign. But when the majority of donations to candidates are from Big Money donors and secretive organizations, the voice of the average people and what they want gets lost. A democratic republic cannot persist under these conditions, and our system, a model to nations all over the world, will slowly wither if we do not fix our broken campaign finance laws. The reason why our elected representatives can be influenced by the person or group with the most money is because a series of Supreme Court rulings have essentially said campaign donations are pure speech and cannot be restricted. Congress has passed legislation restricting the influence of money in politics, but the Supreme Court struck those laws down. Since the Supreme Court made the wrong call, it is up to us to do one of two things to prevent unlimited money from corrupting our elected officials: pass an amendment to our Constitution or create enough popular momentum at the local level for laws to limit the corrosive effects of Big Money that the Supreme Court is forced to reconsider its prior decisions. The Committees believe we should pursue both options to increase our chances of successfully restoring our voices. Many organizations are already involved in the fight to restore the people's voice in our country. Click the links below to get involved in protecting our democracy. And be sure to use The Committees central list with the contact information for all of your state and federal representatives. Remember, our representatives will be forced to take action if enough of us make our voices heard.